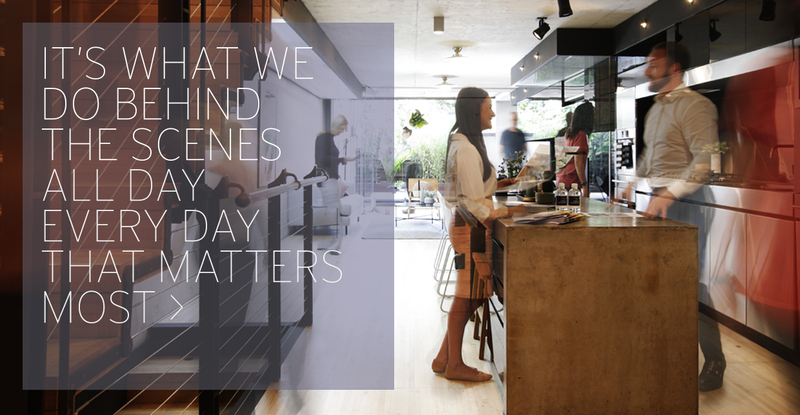 With more than a decade as an Inner West Real Estate authority, Damon Parker assisted by Emily Caetano share Cobden & Hayson's commitment to transparent communication and outside the square thinking. Real Estate is no longer a week by week, month by month business. Instead, it’s minute by minute. Now, more than ever, a distinct mastery of digital marketing channels and an intimate understanding of the psychology of buyer behaviours sets our team apart from traditional agents. Whilst leading the industry with technology, we also appreciate the personal elements required to satisfy each client we work with and are constantly evolving sale processes to ensure our results remain at the highest level. The ability to involve our clients in all facets of the campaign is crucial. It is important that our clients can keep their finger on the pulse of how their campaign is tracking and have the ability to make informed decisions in much shorter timeframes that the industry norm. Unique to Cobden & Hayson, we have a Vendor Portal for you to log into 24/7. The portal gives you live feedback of how your campaign is tracking including purchaser feedback, agency activity, marketing proofing, offers received and specific buyer activity. Our strong track record and dedication to unparalleled customer service and the latest technology guarantees that our clients’ profit from our experience and first class market knowledge. We have generated multiple record sale prices across the Inner West region, with an average of 8 days on the market. I’m also very proud to say I have a track record of a 100% overall clearance rate on over 300 personal sales. "I would unreservedly recommend Damon and the Cobden and Hayson team as sale agents. Damon went above and beyond the requirements of a real estate agent, and made every effort to keep me informed along every step of the way. He provided extremely sound advice, and the steps taken meant that we received the best possible outcome for the sale of the property. I will certainly return to Coben and Hayson the next time I require real estate services. Thank you again." "Working with Damon and his team was the best real estate experience I've had yet. Damon exceeded our expectations every step along the way. We have two small children and an interstate move to manage, so selling our home had the potential to be very stressful. It wasn't. Damon had all the contacts for all the trades, stylists, solicitors, etc we needed and he managed everything end to end with us. He had our backs the whole way. It was like we hired a real estate agent but got a really good project manager thrown in for free. His suggestions of small works to be done and styling is without a doubt why we reached a result beyond our expectations. Damon is an excellent communicator. He called every day to report on progress and check to see if we needed anything. The online portal be uses is also an extremely good tool for us to keep check on live progress throughout the campaign. Damon was transparent with everything along the way as well, both with us and the buyers. I feel we achieved a great result using his morally sound and transparent strategies to achieve maximum price. His diligence was second to none, right up until the night before the auction where he took 3 late night calls from a nervous buyer on a Friday night and was calling us inbetween for fact checks. It turns out this buyer was the highest bidder and she was therefore crucial to our result. We thoroughly recommend Damon to anyone looking to sell and if we sell again I would return every time." "I just wanted to thank you for selling my property this week. It was a great result and to have it all wrapped up 2 weeks before the auction date was an added bonus. It's been great working with you in the lead up to and throughout my campaign period. Thank you for convincing me that I needed to spend money to make money. I can now see how without doing so and without your professionalism and know how, we wouldn't have achieved such a great result. I am very happy with the communication between us, the Vendor Portal was very helpful and informative with every step of the way. So thank you again and all the best for your future sales." "Dear Damon, the moment we met you we knew you were the right person to sell our home. You always went above and beyond in all your efforts and have excellent communication skills. We always felt comfortable, every step of the way, as you always informed us of what our next steps in the process were. Nothing was ever a problem and you were amazing at organising tradespeople, gardeners and styling in order for us to get the best price on our house. We really appreciated that you were available anytime and were happy to visit us when it was convenient for us given we both work and have 2 kids. You always took extra time to talk about anything we were concerned about and made sure we were comfortable with all decisions before moving forward. As this was our first time selling our home, we were not sure what to expect. You exceeded all our expectations, and we would highly recommend you to anybody selling a home. Lastly, we really enjoyed the process of selling our house with Cobden & Hayson and we will miss your phone calls with daily updates." "We have now exchanged contracts on our second transaction together – the first with me as the buyer, and this one with me as the seller. I was impressed, on our first transaction, with the diligence, efficiency and high ethical standards you showed when representing the vendor, and in particular with the way in which you sought to protect the interests of your client. I resolved at that time that if I were to sell a property in the Inner West, I would use you as my agent. As we both know, that opportunity arose, and I appointed you as my agent to sell 1 Forsyth Street, Glebe. You showed all the qualities which originally impressed me - diligence, efficiency, high ethical standards and a focus on the interests of your client, the vendor – and revealed others which underlined the correctness of my choice. I was very impressed with the strategic good sense which you demonstrated in your marketing advice, by the accuracy of your price estimates and by the deft tactical skill which you showed in managing a group of potential purchasers so as to secure the sale at a very satisfactory price. I was very impressed, too, with the pragmatic realism which you brought to the entire process. So, I would have no hesitation in either using you as my agent for any future sale in the Inner West, or in recommending you to other potential vendors. If it is of any help to you, please feel free to quote this letter to other potential clients, or to put selections from it (with my name and contact details deleted) on your website. As promised, I will look forward to inviting you and Emily to a lunch of spectacular excess, following completion of the sale."